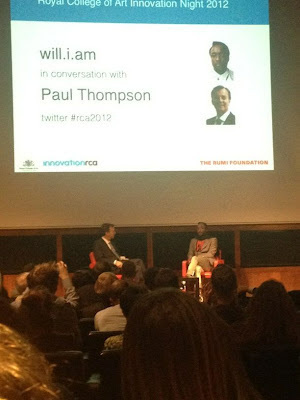 The RCA recently hosted the annual innovation night discussion at the Royal Geographical Society, London with Paul Thompson. It was suggested at last years event when Christoper Bailey (from Burberry design) was asked who should be invited to speak at the 2012 event, he recommended will.i.am would be an ideal guest to have at this event. The RCA worked their magic and succeeded to just that. An insightful introduction into the work of will.i.am, that expands from initial routes in music to fashion, business, design, consulting on conceptual thinking and lots more beyond (and that's just what he had time to talk about!). Many other stories of Will's journey from his humble beginnings to his interest in innovation, particularly within the technology domain were quite entertaining to listen to. The highlight of the night was to hear when asked what Will thinks will be the design of the future, to which he responded would be wearable technology with gestural interfaces. We look forward to that will.i.am project!